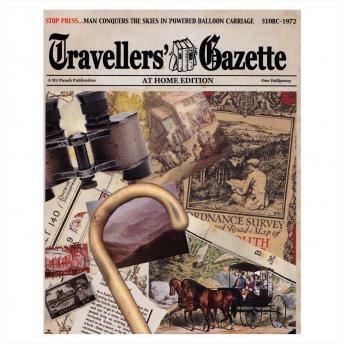 The Travellers Gazette is a vivid portrait of British life through the centuries, as lived by the generations of men and women who took part. We follow in the footsteps of the intrepid British traveller as they explore the world both at home and abroad and eavesdrop on their personal recollections providing us with an entertaining collection of wry anecdotes and finely observed detail. In the At Home edition, we embark on a fascinating ramble through the towns and villages of the British Isles during the last 400 years in the company of Jane Austen, William Cobbett, Daniel Defoe, James Lees Milne, Sir Walter Scott, Virginia Woolf and many others as we travel by steam ship, mail coach and hot air balloon from Cornwall to the Scottish Highlands. Narrated by Eileen Atkins; Cheryl Campbell; Nigel Davenport; Alex Jennings; Richard Johnson; Hugh Laurie; Michael Maloney; Geoffrey Palmer; Michael Pennington; Prunella Scales; Samuel West, and John Wood.